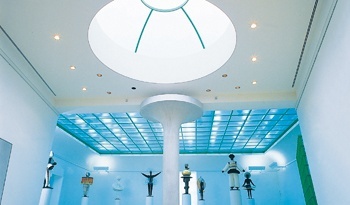 Ventilation and air-conditioning in museums have to fulfil several tasks: providing conditioned fresh air for visitors, and removing emissions such as CO2, moisture from exhaled air or vapours from furnishings. The aim is therefore reliably ensuring a defined climate with a consistent and mostly rather low room temperature and humidity, to protect art treasures from temperature fluctuations and moisture absorption. In cultural amenities such as theatres, opera houses or other places open to the public, the room air quality and comfort for the visitors are paramount. The size, the numbers of visitors and architectonic factors often present major challenges for the air flow concept, comfort and acoustics. For untroubled enjoyment of art, the air-conditioning components used must of course be as unobtrusive as possible, and not disturbing the atmosphere of the room either acoustically or visually. An ambitious task – with a wide range of options to handle it! For an optimum result and for maximum planning dependability, we can assist you with our expertise as early as the planning phase with LTG’s engineering services, offering you flexible, very comfortable and efficient solutions with LTG air/water systems, air diffusers and air distribution components. For the enhanced requirements of air-conditioning for museums, cultural institutions and places open to the public, we offer flexible and energy-efficient solutions. All systems are of course available with a customised LTG control concept and components. can be perfectly integrated into the architectonic design. Thanks to LTG SystemDesign, all the floor components can be combined inconspicuously to provide the same overall appearance. High-precision components from LTG air distribution with a complete range of round and angled pressure controllers DRE/F, flow rate controllers VRE/F/D (also with LTG ActiveControl system for high precision in a very small space) plus valves and accessories complete the planning for an energy-efficient HVC system. We would be happy to assist you as part of our LTG engineering services in the selection and validation of the right air-conditioning system or for particular requirements.